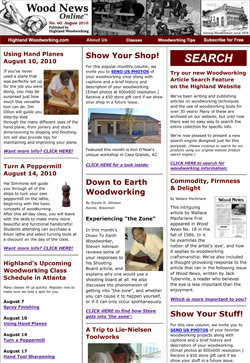 The August edition of Highland Woodworking’s free online newsletter, Wood News, is on the stands and chock full of interesting reads. Our Down to Earth Woodworker, Steven D. Johnson, takes some time to discuss getting in and being in the “zone” in his woodshop. Check it out if you’ve ever been in the “zone”, and hope to find a way to spend more time there! We’ve brought back one of our original columnists with a reprint of a fascinating article written by Wallace Macfarlane about the importance of having “the eye”, as well as one of the intriguing responses we received from a customer who read his article and had his own opinion on the subject. Featured in our Show Us Your Shop column is Ken O’Neal’s unique workshop that contains no drawers or doors on the cabinets. And Tom Guralchuk’s beautiful woodworking is highlighted in our Show Us Your Stuff column. A newly updated class schedule and many exciting deals make this Wood News a great read for anyone, and there is much more that I haven’t even mentioned here! You should really just go check it out yourself. Enjoy!